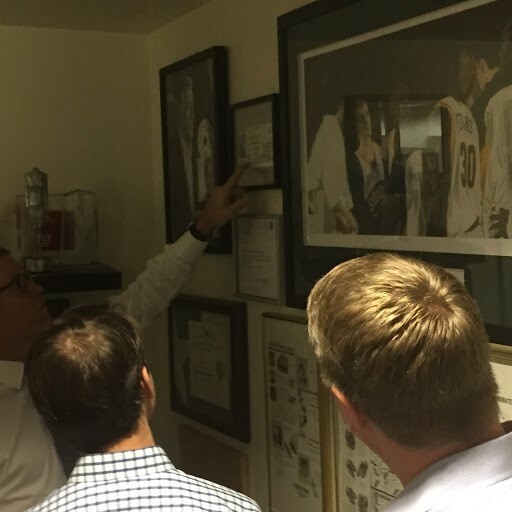 Remembering Blake Nordstrom | Tour Guide… of the Executive Men’s Room! Tour Guide… of the Executive Men’s Room! In March of 2017, our Regional Logistics Managers were in town for meetings, and the Corporate Logistics (ILI) team had arranged for them to see a finished model of the NYC stores currently under construction, found in the executive wing. Lee Cohrs saw Blake in his office and asked if he would be willing to meet the group and answer any questions. Blake enthusiastically joined us. After a few minutes of talking about New York, someone in the group said they heard a rumor about items on the wall in the Executive Men’s Room. Without hesitation, Blake said “Yeah, you want to see it?! ?” There were probably 15 of us, men and women, that quickly followed Blake down the hall, past the admins, straight into the executive restroom. The walls were full of ‘memorabilia’ – letters, pictures, magazine covers, including a few less-than-flattering letters sent directly to Blake. His enthusiasm actually escalated as he hysterically read aloud the latest examples, including a postcard with only 13 words, of which four I cannot repeat. After he finished laughing at himself, he said that he used examples like this to keep his leadership team humble. I always appreciated Blake’s humor, humility, and showing us that we don’t always have to take ourselves too seriously. Thank You Blake! Your Leadership was Inspirational!